The following section describes how to update your ActivityInfo version. As new updates to ActivityInfo are released, you will need to update your version to ensure you have the latest improvements and bug fixes. Normally, you will be notified when a new release of ActivityInfo is available. However, if you are not able to update immediately, you can always manually update to the latest release. 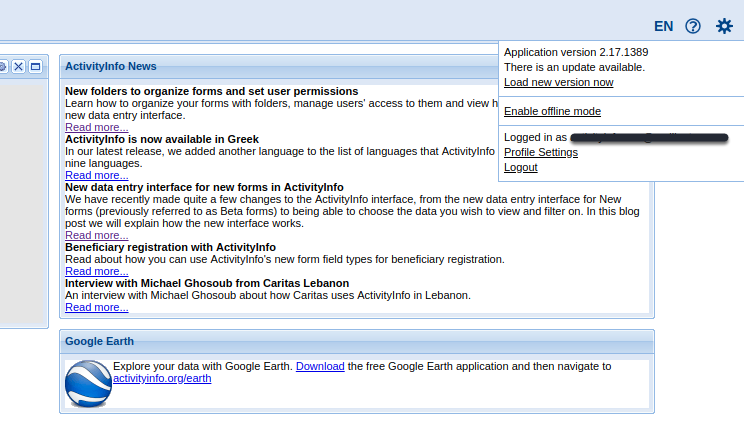 When a new release of ActivityInfo is available, the system will update automatically when you log in and notify you. Click "Yes" on the notification to reload to the latest release. On any ActivityInfo page, click on the Gear icon in the top right-hand corner. If there is a new release available to download, you will see a line stating "There is an update available". Click the "Load new version now" link below it to download the latest release to your system.